Ah, to be a kid again. No worries, no cares. It's just a happy-go-lucky existence free of bills, appointments, long-term planning and serious responsibilities. The memories can by idyllic, but studies show that kids today are often under more pressure than their parents ever were. From their parents. From their teachers. From coaches, instructors and peers. Some take it all in stride, but they tend to be the exceptions. Many more naturally falter from time to time. Just like adults, they fall victim to performance anxiety. "It's an age-old issue that really has been around forever," says Wendy Bleeker, director of the School Counseling/Social Behavioral Health Programs at Whitworth University. "But with high-stakes testing and higher requirements and expectations, I'm hearing from counsellors that performance anxiety has increased." 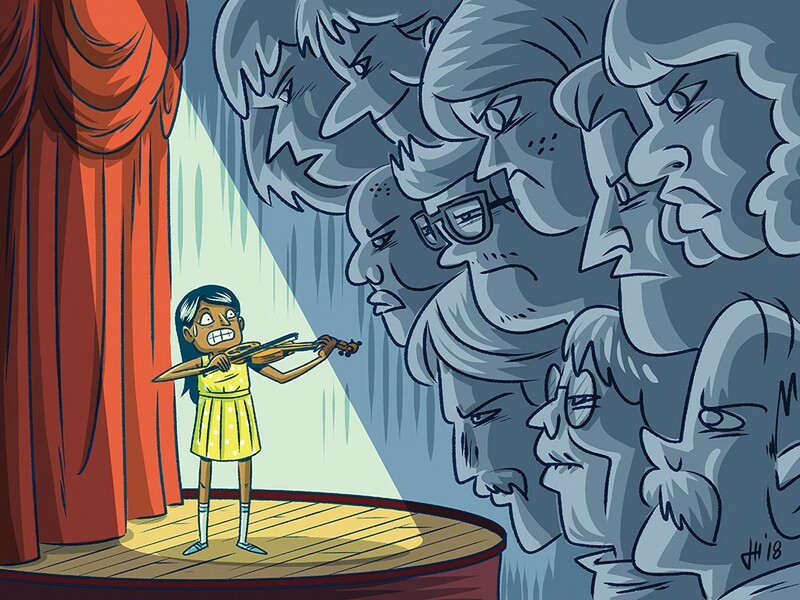 In humans, regardless of their age, performance anxiety is a natural response to any scenario in which skills are being showcased or assessed in some way, whether it be appearing in a musical, running a race, taking an exam or playing the violin. Some psychologists and evolutionary biologists have theorized that it comes from a deep-seated fear of being ostracized from our chosen social group — a fear that can perhaps be traced back to some primitive point in time when pack hunting offered our only chance of survival. However, as Bleeker notes, that natural response seems to be evoked in children more and more these days. "Where does that come from? It's increased stress at school and within our society. Twenty years ago, kids would go out and play. Nowadays kids are doing more structured sports and are engaged in more out-of-school activities," she says, adding that the cultural and individual bases for performance anxiety extend far beyond that. For example, when children and teens are made to feel — not always without reason — as though everything counts toward some future goal, such as university placement, scholarships and career opportunities, or that every moment is being recorded for public consumption and posterity, it can compound the pressure of a five-minute piano recital or a recreational soccer match. Chris Moore, a student services coordinator at Spokane Public Schools, says that social media can be a factor too — even indirectly. "When you post on Facebook, Snapchat and Instagram, you can post and purport to be whomever you desire to be. Kids, with their developing mindset, are not able to see what's reality and what's idealism or perfectionism. They see Mom and Dad playing into what their friends are posting." In turn, they can feel compelled to live up to the public image their parents are curating. With all those complex external forces acting upon today's children and teenagers, how can they learn not to let performance anxiety get the better of them? "As educators, as community members, as parents," says Moore, "we need to give our kids skills and strategies to build their toolbox to try to mitigate the effects of anxiety and the impact it has on our kids. Kids are not going to learn it on their own." The first step toward equipping kids with that toolbox lies in identifying the signs. "You're going to see anxiety differently," Bleeker says. "For some kids, they're going to give up. Some kids are going shut down. Some kids express their anxiety in frustration and anger. It's a wide variety of behaviors that are as unique as the kids." Common symptoms include difficulty breathing, sudden tantrums or an inability to focus. "Some kids have very cold fingers. Some talk very loudly, exaggerate their laughing. A few kids will just tell me, 'I'm not going to do the performance,'" says Tsai Feng, a Chinese émigré who studied at the Saint Petersburg State Conservatory in Russia and worked as a vocal coach in Beijing. Together with her husband Xu Duo, she now runs a Spokane-based violin and piano studio. To work through more serious cases of the butterflies, Tsai suggests that her piano students try the quick mental trick of acting like they're in an ordinary piano lesson or blocking out the audience by pretending it isn't there. If that doesn't work, particularly for her younger or more self-conscious students, she encourages them to just give it their best shot. "Usually I tell them, 'You've prepared so much for this moment, why don't you just try?' Sometimes I will take them aside and repeat what they have to focus on, on the music. I don't want them to focus on the nervousness; I want them to focus on the performance." Most of the recommended exercises for transcending performance anxiety consist of just that — transferring the focus from the possibility of "choking" to the act itself. As a result, they're not all that dissimilar to meditation and mindfulness practices. "Mindfulness is, simply put, paying attention in a particular way at a particular moment of time," Moore says. "Jon Kabat-Zinn has brought mindfulness and mindful practice to the forefront in this country, and there is empirical research that [it] decreases anxiety. It forces kids to get out of their head and bring their focus to the present." She says one of the most effective on-the-spot calming methods is "4, 5, 6" breathing exercises: Breathing in through the nose for a count of four, holding it to a count of five, and then a slow, controlled oral exhalation for a count of six. Yet the most effective way to alleviate momentary pressure is to begin long before the event itself. Moore recommends regular journaling as a way to relieve stress, as it enables kids to articulate their concerns and emotions over weeks and even months. She also encourages adults to find ways to increase face-to-face communication with their children and reduce the fast-paced agitations of screen time. Tsai and Bleeker are advocates for "practice, practice, practice," in Bleeker's words, as the best preparation for a performance is mastery of the material. That often requires some investment from parents to help children review and reinforce whatever is being learned in school, on the playing field or in the rehearsal space. On the big day, the crucial thing to avoid is urging the child or teenager to simply get over their nerves. That can exacerbate the situation by making the anxiety into another obstacle to be overcome. Instead, the best course of action is to restore perspective by reassuring them that any slip-ups and imperfections aren't the end of the world. "It's about having a conversation with your children that this is just a small part of who you are," says Bleeker. "You are so much more than this one activity, so much more than someone who takes a test. They have to know that it's okay to make mistakes. If we didn't make mistakes, we wouldn't learn. That's the process of growing." "We can have high expectations for our kids," adds Moore, "but we need to mirror that with high levels of support." The original print version of this article was headlined "Under Pressure"